ResponseWare is a way to conduct interactive polls and receive text responses from students during lectures utilising students’ own devices, whether a smartphone or laptop. Whilst some Departments have ‘clicker’ provision (see In-class Clickers), using ResponseWare eliminates the need to hand out devices, saving capital expenditure and more importantly time in class. The text message functionality can also be used to collate student comments and questions during a lecture to be addressed at the end or at points dedicated to answering student queries. This enables more students to provide feedback and indicate their understanding to the lecturer in larger classes than traditional Q&A approaches. The question wording does not need to be restricted to factual recall. Indeed, using the poll system to get a sense of perceptions on a hypothetical situation can be a meaningful trigger for debate. The polls run within a PowerPoint slide deck. With the TurningPoint software installed you create new slides using the TurningPoint ribbon (toolbar) based upon the question type you want to use. There are a range of features, see the video guides linked at the bottom of this page. The TurningPoint software is installed on all lecture room PCs and it can be installed through the Software Centre on supported staff PCs. They are then connected to the poll to receive the questions/answers to their device and send answers/messages back. At the end of the session you can save the data collected through the poll and use it to work out the performance of the cohort, identify where areas may need to be covered in the next lecture or provide supplementary resources. 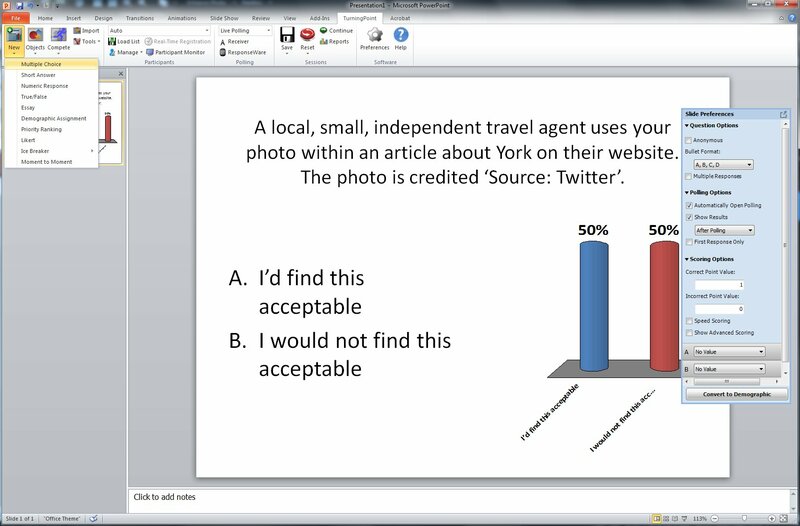 The video below shows how in-class polling has been applied at York with both small group teaching. In-class polling to engage students in lectures. If you are currently using in-class polls or are interested in this technology, please join the ResponseWare mailing list to find out about how others are using the tool and share your experiences. Our basic guides go over how to create a TurningPoint poll with ResponseWare and how to run it in a lecture. Please note that after setting up an account, it can take up to 24 hours for this to be activated to use with learners or delegates.